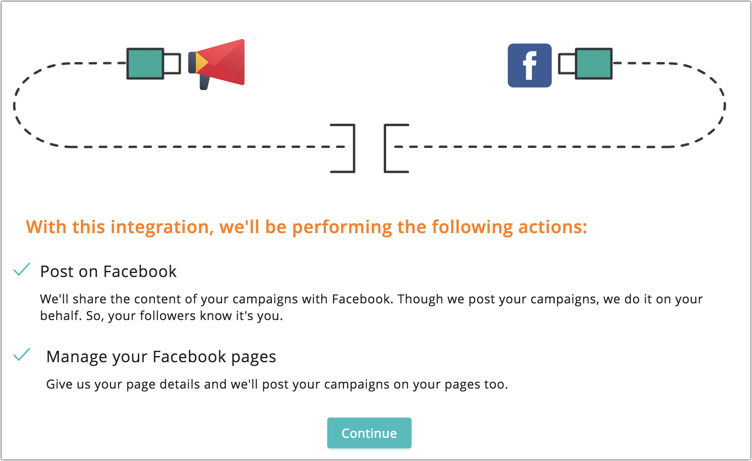 Zoho Campaigns integrates with social media sites such as Facebook, Twitter & LinkedIn so that you can post your campaign, start the page campaign and share your email campaign on social media. From the Navigation toolbar, click Settings. 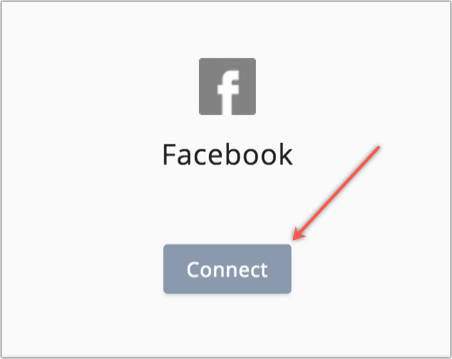 Mouse over Facebook and click Connect. We'll share the content of your campaigns with Facebook. Though we post your campaigns, we do it on your behalf. So, your followers know it's you. Give us your page details and we'll post your campaigns on your pages too. 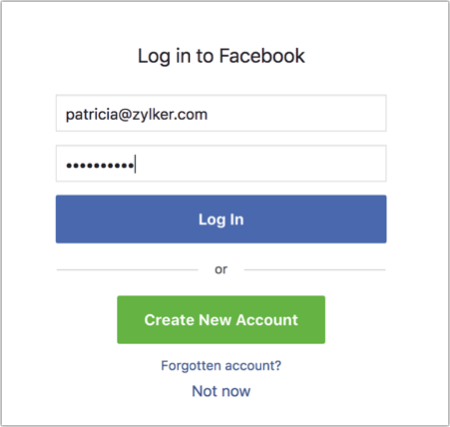 Login to your Facebook and click Continue. You can integrate multiple accounts. 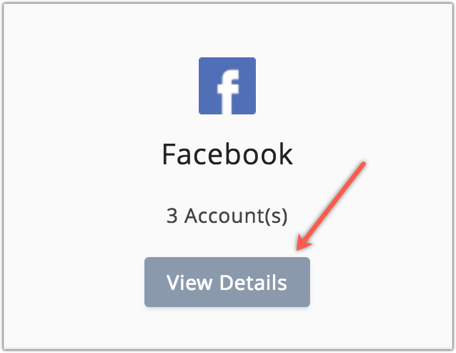 Click Facebook under Integrations and click Add Accounts to integrate another account. What happens if I deny my Facebook account integration? You can't share your campaigns on Facebook. You can't post social campaigns on Facebook. Mouse over Facebook and click View Details. Click the Deny button beside the account name. This option is visible only for the Facebook account owner. You can't deny an integration with another user's Facebook account. 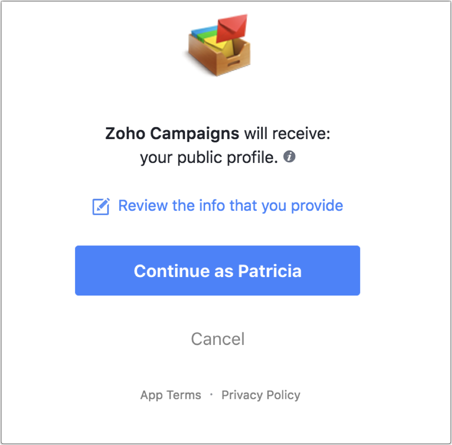 To update recent changes of Facebook in Zoho Campaigns, click Reassociate next to the Deny button. Mouse over Twitter and click Connect. 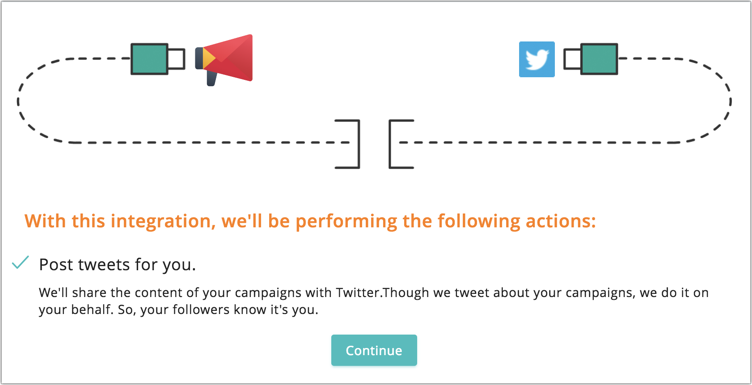 We'll share the content of your campaigns with Twitter. Though we tweet about your campaigns, we do it on your behalf. So, your followers know it's you. Enter your Twitter credentials and click Authorize app. You can integrate multiple accounts. 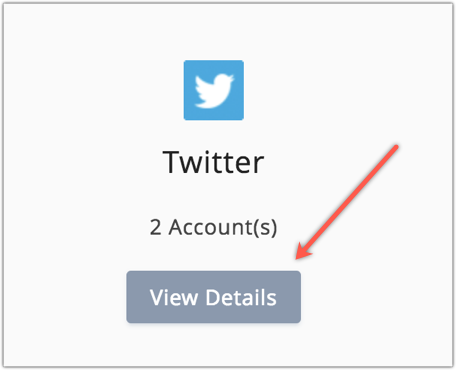 Click Twitter under Integrations and click Add Accounts to integrate another account. What happens if I deny my Twitter account integration? You can't share your campaigns on Twitter. You can't post social campaigns on Twitter. Mouse over Twitter and click View Details. This option is visible only for the Twitter account owner. You can't deny an integration associated with another user's Twitter account. 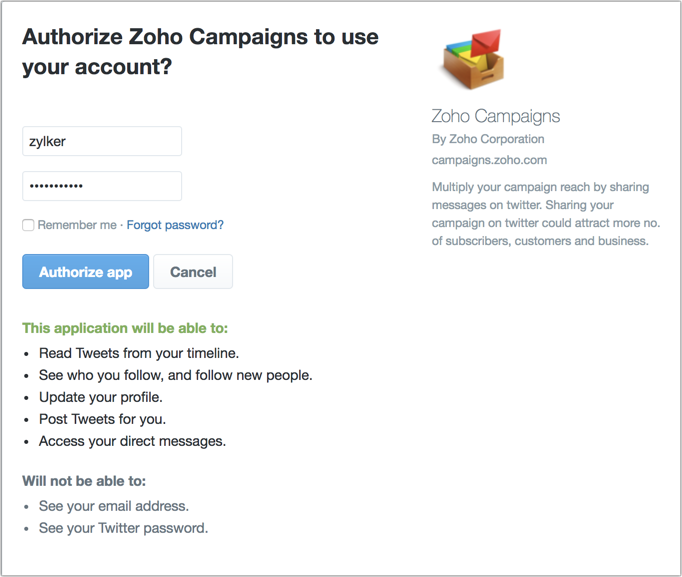 To update recent changes of Twitter in Zoho Campaigns, click Reassociate next to the Deny button. 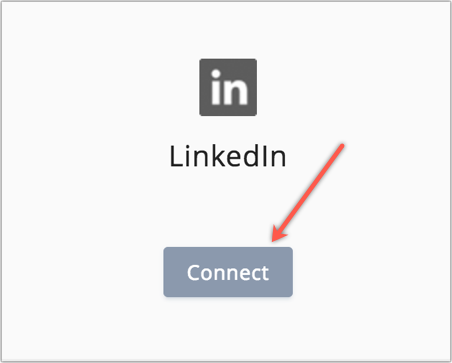 Mouse over LinkedIn and click Connect. We'll share the content of your campaigns with LinkedIn.Though we post your campaigns, we do it on your behalf. So, your contacts know it's you. Enter your LinkedIn credentials and click Allow access. You can integrate multiple Invoice accounts. Click LinkedIn under Integrations and click Add Accounts to integrate another account. What happens if I deny my LinkedIn account integration? 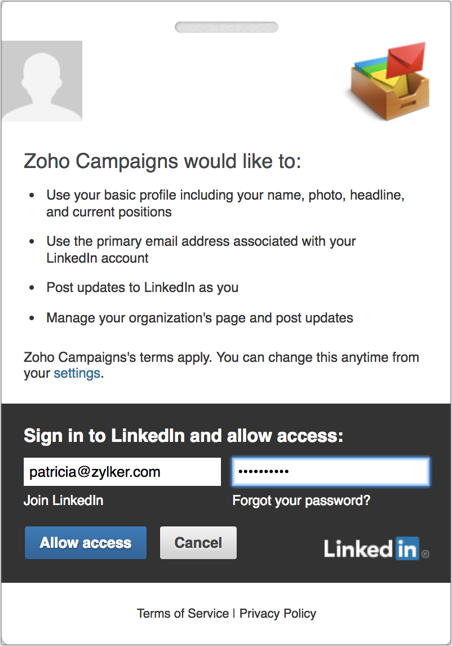 You can't share your campaigns on LinkedIn. You can't post social campaigns on LinkedIn. Mouse over LinkedIn and click View Details. 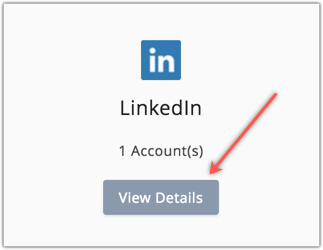 This option is visible only for the LinkedIn account owners. You can't deny an integration which involves other user's LinkedIn account. To update recent changes of LinkedIn in Zoho Campaigns, click Reassociate available next to the Deny button. Mouse over Tumblr and click Connect. 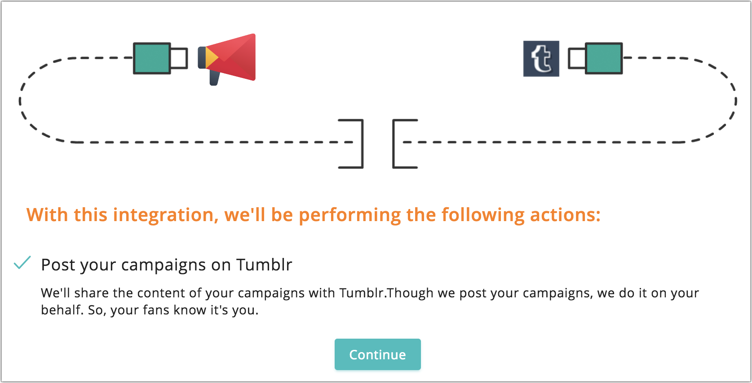 We'll share the content of your campaigns with Tumblr.Though we post your campaigns, we do it on your behalf. So, your fans know it's you. 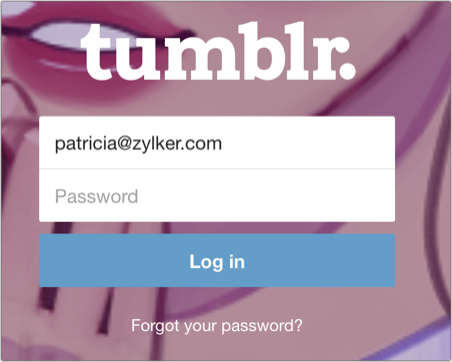 Login to Tumblr and click Allow. You can integrate multiple accounts. 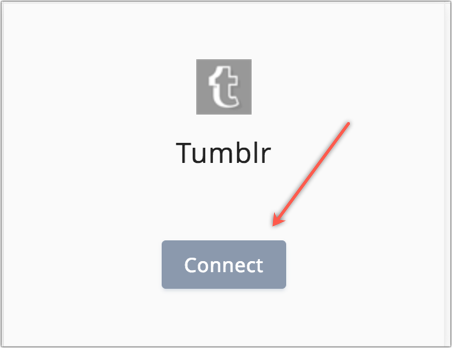 Click Tumblr under Integrations and click Add Accounts to integrate another account. What happens if I deny my Tumblr account integration? You can't share your campaigns on Tumblr. You can't post social campaigns on Tumblr. Mouse over Tumblr and click View Details. This option is visible only for the Tumblr account owner. You can't deny an integration associated with another user's Tumblr account. To update recent changes of Tumblr in Zoho Campaigns, click Reassociate next to the Deny button. Mouse over Google Plus and click Connect. We'll share the content of your campaigns with Google+.Though we post your campaigns, we do it on your behalf. So, your followers know it's you. 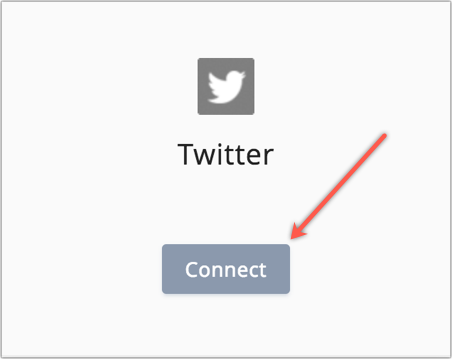 Log into Google Plus account and click Allow. You can integrate multiple accounts. 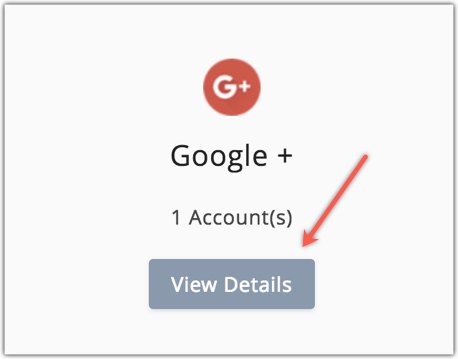 Click Google Plus under Integrations and click Add Accounts to integrate another account. What happens if I deny my Google Plus account integration? 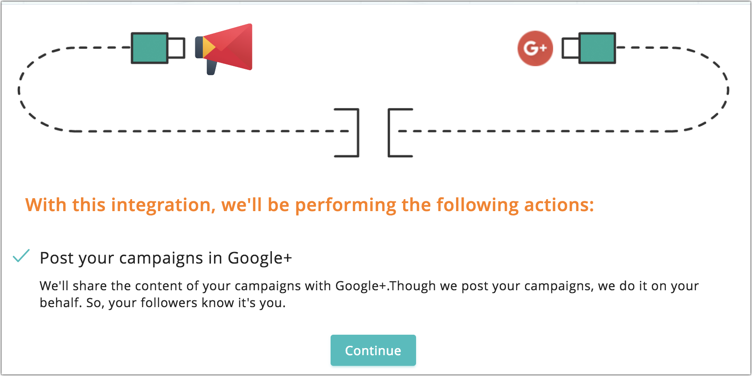 You can't share your campaigns on Google Plus. You can't post social campaigns on Google Plus. Mouse over Google Plus and click View Details. 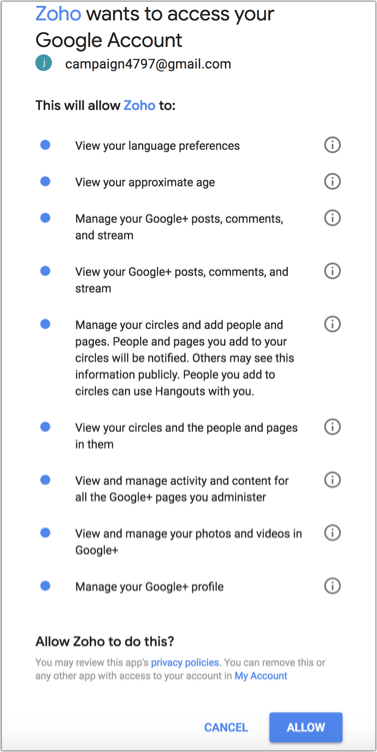 This option is visible only for the Google Plus account owner. You can't deny an integration with another user's account. To update recent changes of Google Plus in Zoho Campaigns, click Reassociate available beside Deny button.